Have you heard of the KonMari Method of organizing your home? Well, don’t tune out yet. It’s NOT just for organizing your sock drawer! 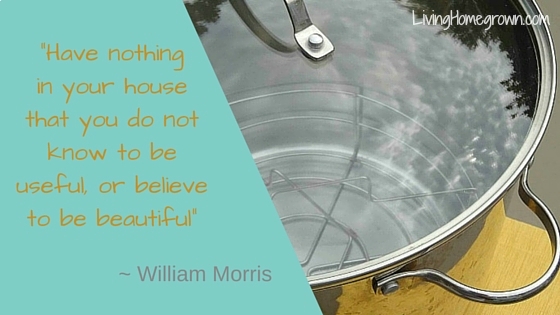 I’m talking canning supplies, gardening tools, my pantry…everything. Although I’m not done getting my home in order, I’m so excited about the results so far. So, I wanted to share how it is going with you. Even if you have never heard of KonMari, you will eventually. So in this post, I demystify the whole thing for you so you can see if it might be something to try in your own home or homestead. Now, if you would rather LISTEN to this info, head over to this week’s podcast episode. To be honest, there is always more information in the 30 minute podcast than I can fit in a single blog post. So to get the full scoop, you should listen or read the transcript on the podcast page. It’s good stuff! The KonMari Method really started to gain popularity here in the United States at the beginning of 2015 and it’s been a really big buzz. When I first heard about it, I have to be honest — right off the bat I decided it was not for me. The approach just seemed a little hokey. But as I started to hear more and more people, including some of my friends, using this type of organization and calling it “life-changing,” it sparked my interest and I decided I needed to see what all the fuss was about. 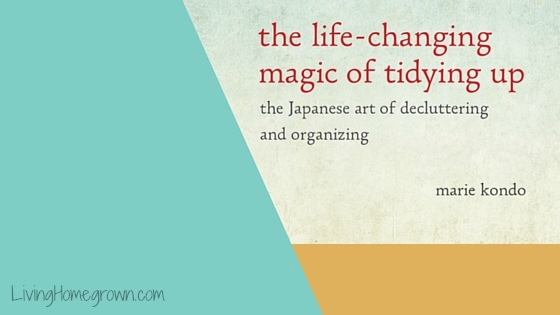 The KonMari Method comes from the book called The Life-Changing Magic of Tidying Up* by Marie Kondo. 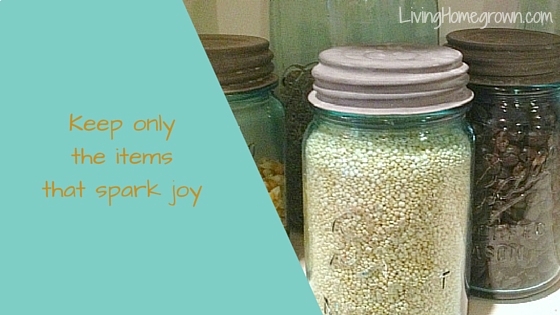 It’s about bringing more joy and happiness into your life by reducing clutter. I’ve always known that keeping my desk clutter free helped keep my brain clutter free as I was working. So, I sorta got it. But seriously…who has time to organize their sock drawer or even their t-shirts, right? Well after I started using this method in my home, I found that not only is it worth the time to do…but it makes everything I do more efficient. 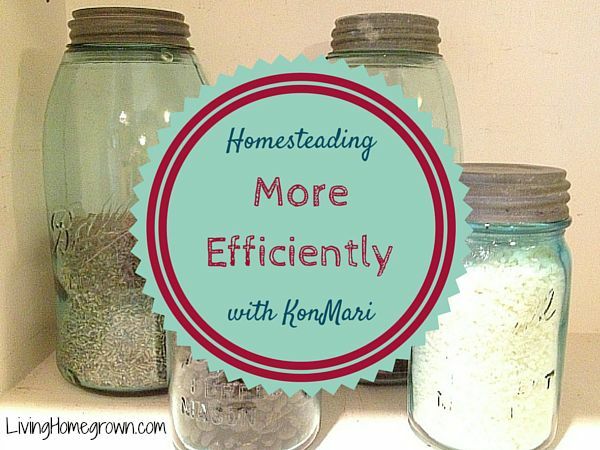 And I’m ALL about being efficient with my time – especially when homesteading! The very first step is hugely different than traditional approaches to organization. Instead of tackling the hall closet or some other space in your home, you actually organize by category. So for example, you organize clothes, or gardening tools, or canning equipment. Not your bedroom closet, the garage or your pantry. In other words, you go through your entire house and find every item you own that fits that particular category. Once you’ve found everything in your house that fits the category you’re tackling, take all of it and dump it on the floor so you have everything all in one room in one place. It might sound a little silly but it’s really important to round up everything you own in your target category all in once place. In my case, when doing canning equipment, this meant my entire living room floor was covered with literally all my canning equipment – jars, rings, vintage jars, my water bath canner, pressure canner, etc. Step 3: How Does Each Item Make You Feel? Now when I first heard this step, I have to admit, I thought it was very nutty. But trust me, if you go with this, it really, really makes all the decision making so much easier. The idea in Step 3 is that you only want to pick what you are going to KEEP, not what you are going to throw away. And you only want to keep items that bring you joy. Well the way I worked around that was I kept things that either bring me joy or are extremely useful and I have to have them (e.g., my iron). As I was going through my canning supplies I realized I had some jars that were chipped and some canning rings that were rusty. I even had a whole bunch of vintage jars that were just packed away that I wasn’t using at that I just adored. Those definitely brought me joy and I wasn’t using them! By having everything in one place it really forces you to see where perhaps you have spent way too much money or where you need to buy more. I definitely realized that I had a lot of rusty rings – so they were not to be kept. But of course my pressure canner and water bath canners bring me great joy so they were keepers. Once you have gone through the entire pile, you will be purging or getting rid of so many things that do not bring you joy. It’s time to give those away so someone else can use and enjoy them or toss them if no longer usable. The end result is you have a lot more space for the things that DO bring you joy and the idea of putting the things away is so much easier because you’ve cleared out all the clutter. Sometimes it can be hard to part with items, particularly gifts or items you spent a lot of money on at some point. This is really important: You should not keep something out of obligation if it does not bring you joy. Be grateful for the gift and the thoughtfulness behind it, but you do not need to keep it out of obligation because the person who gave it to you would not want you to have resentment or worry or guilt every time you see that item. They would want you to have happiness in the fact that they gave it to you. If you don’t get happiness from it, then you should pass it on or give it away or hand it off so that someone else out in the universe can use that item and get enjoyment from it. Those are the four simple steps you can follow to apply the KonMari Method to your homestead. 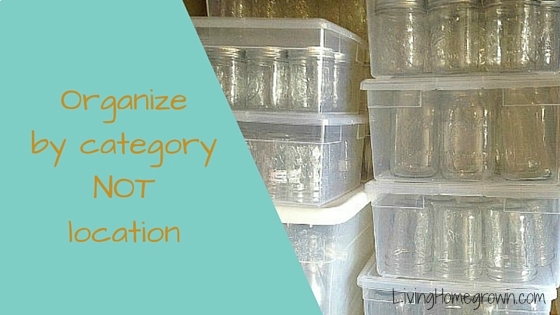 What do you think of this organizational method? Gonna try it? Theresa, thank you for this podcast! I had also heard of the book through other podcasts and immediately dismissed it in my mind. I am extremely practical and the “only if it brings you joy” part seemed absurd. You adding the “useful” part, and describing how you made it happen in your home and your life made it click with me and seem do-able. Thank you for the inspiration! I hear ya Machelle! I thought the exact same thing! But then when I started to read the book, so much of the technique worked for me. I started out with the goal of just using the parts that felt right. Then…as I got into it…I ended up enjoying the results so much. The “joy” part made more sense when pulled into a more logical framework in my head. Glad that thought process feels right for you too. I think you will definitely get something out of trying it. I also read the book and it really does make sense. Thank you for addressing this important topic which can help us all be happier and more organized. Sure Karen – I know we sort of drank the Kool-aid and all that. But I really do feel more relaxed when I open my closets and pantry. I never in a million years would have thought it would make such a difference. I’m on a mission to do my whole house now. Hi Theresa, this sounds like something I need to do! Will let you know how it works out for me! Thank you! Yes – let me know how it goes for you! I suggest step 5: When you’re done with something, PUT IT BACK!!! My high school shop teacher had a similar motto: A place for everything and everything in its place. That’s a good motto, for sure. Thank you for explaining this so nicely. I know I would never have taken the time to look into this if not for your blog. I will definitely be trying this and so will my sixteen year-old daughter whose room looks like a landfill 🙁 Thank you! Think this will work for a 73 year old? I start to throw out and just can’t seem to do it. Absolutely it will work. I think (for me at least) the key is taking everything out and then picking what to put BACK. For some reason, having to pick up each item and hold it helps make the purging part easier. You end up keeping only what you REALLY want to keep. Go for it! This is the method I have always lived by, and has facilitated a beautiful and successful lifestyle and business!